Your best friend or family member is now engaged. 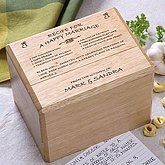 Here are some great engagement gifts for happy couple. These cute and unusual gifts are definitely unique. It's official, the couple is engaged. 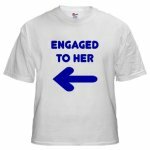 Why not give them His and Hers T-shirt to let the world know of their news? Get a camera and catch a photo of the couple in their enaged T-shirts. 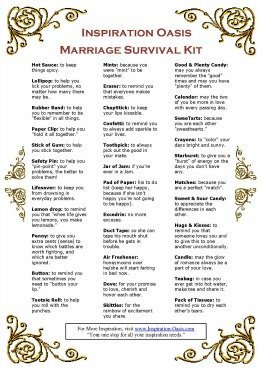 This marriage survival kit is a cute and economical gift that you can make yourself by putting together a few simple items and printing the poster below. WARNING: You must know that the couple has a great sense of humor before purchasing this gift. Give this 8" Ball and Chain - Medieval Replica - Wedding Gag Gift at your own risk. There nothing like a personalized gift to say "I thought about you and got this gift especially for you." 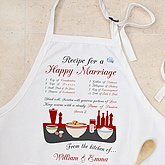 The Perfect Gift for the Engaged Couple! What could be a more appropriate engagement gift than a personalize flute set for them to toast each other at their wedding. 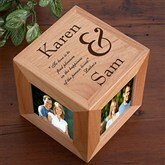 Here is another great engagement gift that can be used at the wedding. Purchase this Engraved Cake Knife Set. This bottle of wine can have up to 2 lines of personalized text (22 characters). 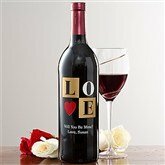 Purchase this Personalized Bottle of Wine. Sweeten with generous portions of love. Keep warm with a steady flame of passion. Suggestion: If you get the recipe box, include some of your favorite family recipes to welcome the newest member of the family into the fold. love is forever, yours and mine." in the happiness of the person loved." it is because of you." This photo album holds an impressive 100 - 4"x6" photos. Can personalized with the couples name along with your favorite verse (1 line / 20 characters) such as: "Happily Ever After" etc. As a couple embarks into a new phase of life there is alot to be learned and it is essential to keep the romance alive as a married couple. A good all purpose flexible gift that anyone could enjoy is a Prepaid Visa Gift Card. 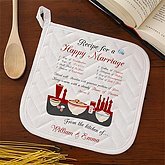 After a couple gets married, they typically will start preparing more meals at home in order to save money for setting up a household, so cookbooks are always a good option. Here are some of my favorite cookbooks geared towards they newlyweds. After a couple gets married, many times they no longer date. That can be disasterous in the romance department, so I recommend gift certificates, or tickets to their favorite recreational activities to keep the spark in their relationship. Give the gift of movies. Order Fan﻿dango Bucks with free shipping. Give a Marriott Gift Card - To Shop. Stay. Dine. Spa. Golf. for that get-away weekend to keep the romance alive. Gift certificates to their favorite restaurant. Tickets to their favorite sporting event or concert. The sooner a couple becomes educated about relationships and marriage the better. Below are some of the best relationship books for couples starting out. Now a days, many couples are left to pay for all or most of their wedding expenses. 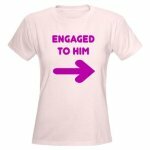 If that is the case, providing an engagement gift that helps defray the wedding expenses would be greatly appreciated. Dance Lessons for the couple, so they can be proud of their first dance as a married couple. 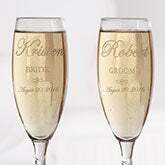 ﻿﻿Personalized Wine Glasses﻿﻿ to toast each other at their wedding day. 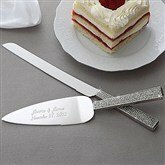 Engraved Cake Knife Set to cut their wedding cake. The Knot Wedding Planning Series to help the bride with all of her wedding plans. I've provided a review of what I believe to the one of the best wedding websites around. A gift of a Wedding Website, will keep everybody up-to-day on the wedding plans. I like eWedding.com the best because of their well-designed themes. View their themes now. Some of my favorite features include: photo albums, videos and music, RVSP management, gift registries, and polls. View all features now. They offer packages ranging from FREE to platinum to suit your needs. You can upgrade at any time.